Laura Geller makes exceptional cheek color products. I have lived in Ethereal Rose Baked Radiant Face Powder ($31) for years - literally years. It's one of my two most reached-for blushes. About Ethereal Rose... Get a fresh, dewy glow with Geller's Ethereal Rose Baked Radiance Face Powder. 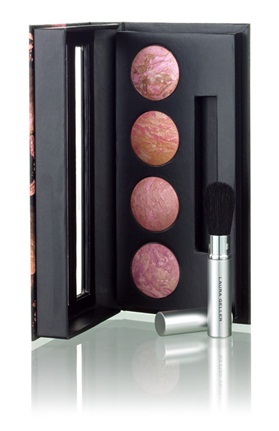 The marbleized tones of pink and pearl cast a flattering glow on your complexion. About Blush & Brighten, seen below...Rich tones of marbleized pigments are swirled together in a soft, silky, powder for a glow-giving blush with universal appeal. Each of Geller's blushes blends multiple pigments for just the right shade of color for all skin types. Laura Geller had a sale recently, so when you go to her site, you'll find some of the shades are sold out. I am sure that's temporary. I think we cleaned her out - all for a discount. I decided I needed to have another Ethereal Rose to keep from panicking when I run out of the one I'm using. While I was at it, I ordered a darker pink for those days when I need a little more color. Here is Ethereal Rose on the left and Roseberry Blush & Brighten ($31) on the right. Both shades are, in my opinion, gorgeous and very natural looking on the face. I swatched them with a sponge-tipped applicator, applying each heavily so that you could see the differences in the colors. I took my photos in full sun. Ethereal Rose is shown at the top of my arm, with Roseberry below. On my face, these blushes are as good as my favorites from Chanel and Armani (I also live in Giorgio Armani's #10, a totally different shade). I don't understand why Laura Geller doesn't get more attention from bloggers. She makes amazing makeup. Can't make up your mind on color? Why not try Baby Cakes Baked Blush Palette. It comes with a retractable brush - four little shades for $39.75. Definitely wait for a sale. Laura Geller has discount events often enough that you can shop online in advance and get ready to order the moment the sale is announced - before your colors start to sell out. To know when events occur, sign up for her mailing list or follow her on Twitter. Her Twitter name is @LauraGeller. I haven't heard of her name yet. What a shame. Thanks for the swatch! I'm looking her up now. Definitely try, Coco. I love her colors. Make that leap and try! I have several Laura Geller products that I purchased from a shopping channel. I have the etheral rose blush and a pretty apricot one as well. I enjoying watching her, she always has great tips. Doesn't Laura Geller sell on QVC? I don't watch (no cable), but sometimes I think that's where I see it when I'm browsing. i won't be purchasing from laura geller. i called them to inquire about product ingredients and the woman who answered the phone wasn't mean, but treated me like i was from mars. she acted as if my question was totally bizarre. i was asking about their tocopherol- was it soy based, wheat based, etc. she then told me that they wouldn't possibly have the time to research that information as they would just take too long. it was her tone of voice that i found so offensive. she sounded so put off, like i was asking her to move mountains. it also made me wonder where this stuff is made and how little control they have over their ingredients? Yes she does sell on QVC, I did'nt know if I could mention that here. she will have a Today Special Value kit sometime in September. I saw a pic of it. I recently got the Roseberry blusher and I love it! It was the first time I had tried Laura Geller and I was very impressed.